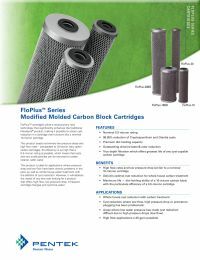 FloPlus® cartridges utilize a revolutionary new technology that significantly enhances the traditional Fibredyne® product, making it possible to obtain cyst reduction in a cartridge that functions like a nominal 10-micron cartridge. This product boasts extremely low pressure drops and high flow rates — comparable to 10-micron (very open) carbon cartridges. Its efficiency is so high that a 0.5-micron rating is possible, which means that cysts and very small particles can be removed to create cleaner, safer water. Note: After installation, flush cartridge for five minutes before using the water.